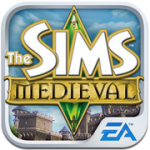 Tear your to-do list in pieces and clear your schedule for the rest of the day, because Sims Medieval is addictive. Not just I’m going to check this out before dinner addictive, this is skip dinner to complete your quests addictive. Can’t think about anything else addictive. Of course from a piece of the Sims franchise we would expect nothing less. 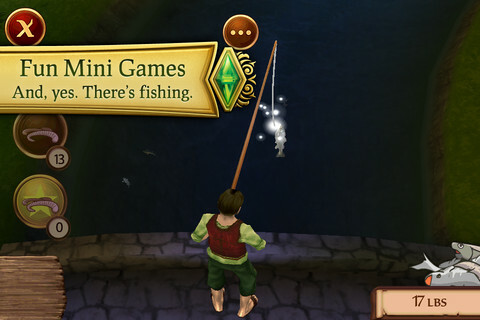 EA knows how to make the grind of life tantalizing, and Sims Medieval for iPhone is no different. The game starts with a clever avatar customization process. Gamers can choose between everything from vampire to shirtless peasant and then customize their character with details like different hairstyles and temperaments. 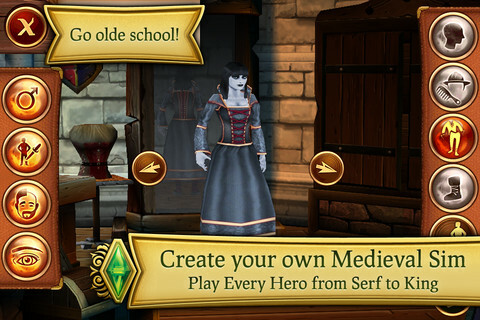 From there EA sends your Sim out into the Medieval Kingdom. You start in a basic home and learn the logistics of taking care of your body with food, sleep, and the standard Sim happiness meters. If you’re familiar with the Sims games none of this should be too surprising. Then you’re ready to head out into the township where the real fun starts. Your character joins the ranks of society and immediately sets into meeting people to talk about science, magic, weapons and more. As your Sim interacts they learn the conventions of charm, friendship, and talking about the right things with the right people. As your Sim interacts with the world they learn to buy from the marketplace and ask for quests that vary from finding lost objects to saving a farmer from a thief. 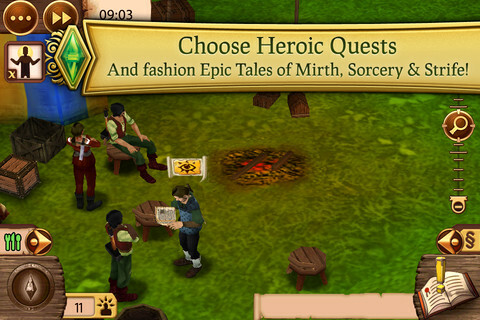 In this way, Medieval leans more toward the RPG genre than usual. Along the way your character learns to fish (which is actually a decent accelerometer based mini game), fight (apparently more interactive than the PC game, but still pretty arbitrary feeling), get romantic, and add people to their guild so they can help you along the way. Adding people to your guild requires a bit of social grace and a common disposition toward good or evil, which adds slightly to the game dynamic. 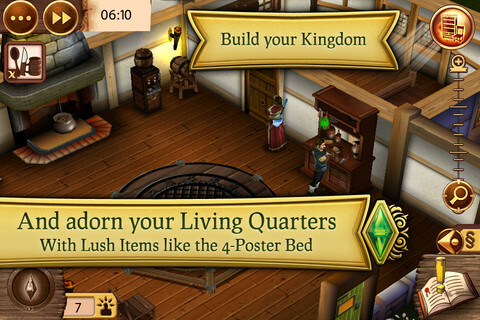 Sims Medieval also features housing, money, dice playing, shopping and gardening, all features that make the game feel like it’s full of time consuming fun and discovery. Although the graphics are solid, I often found myself scrolling about, wishing for a larger screen to house my medieval kingdom. Fortunately, the game is also iPad compatible. Still, since I got the game yesterday I’ve been totally and completely obsessed. I hate to admit it, but I could barely stop long enough to eke an article out without going back and “doing just one more thing” with my Sims Medieval character. I only partially hope (for your sake) that you’ll feel the same. 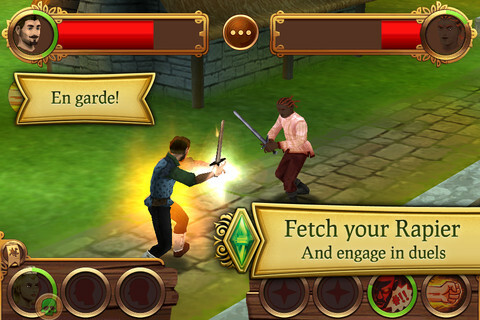 Bottom Line: Sims Medieval is another hit from the EA franchise that’s kept us busy playing God for years. Expect a slightly more RPG feel with this iteration of the game and don’t plan anything else for your day. This game is that good.